Scientists believe the severe drought conditions in California and the brutal cold conditions in the east could be down to a ‘blob’ of warm water lurking down the West Coast. 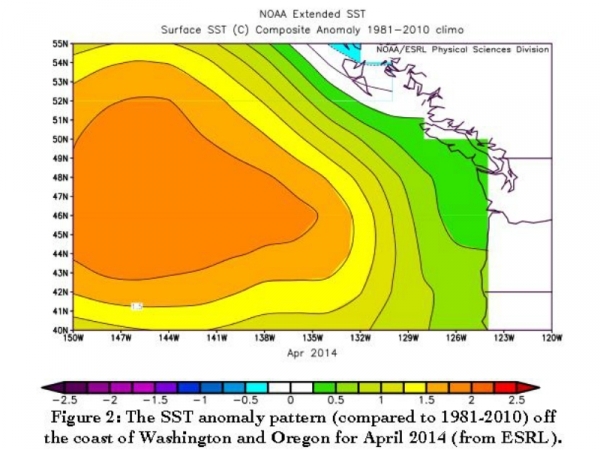 The studied patch of warm water has been found to be 2 to 7 degrees warmer than normal, noticed sometime in the fall of 2013 and early months of 2014. Nick Bond leading a team of scientists from the Joint Institute for the Study of Atmosphere and Ocean points out that after months of studies and observations. The mass of water was found to get warmer even when spring came calling; the hottest that was ever recorded for the area. After further analysis scientists discovered, the blob was 3 degrees warmer than typical ocean waters. The blob is not only affecting the climate of the various part of the country but has been found to have severe effects on marine life. Fish on the West coast have been found to swim to unusual places affirming suggestions that the ecosystem continues to suffer as the warm Pacific Ocean water continues to disrupt the food web. The expansion of the blob is believed to be the main cause of the 1,500 starving sea lion pups and the decline in copepods, as well as the ongoing change in environmental patterns. The blob was not formed by global warming, affirms the scientist but continues to produce conditions and effects synonymous with global warming. The blob influence has also been found to extend inland resulting in unusual weather patterns. Bond attests that the patch of water that is 1,000 miles in each direction and 300 feet deep was the main cause of Washington’s mild 2014 winter conditions that might signal a warmer summer. The blob has also been attributed to the persistent high-pressure ridge thought to be the main cause of a calmer ocean over the past two winters. China emits twice the greenhouse gasses of the United States. I wonder if this blob of warm water has migrated over from the warmed south China sea. Perhaps we should run a computer model, and if the model fits, send the bill to China. what bill? money cannot fix this. The bill for the lost agriculture. This is obviously the work of satanic extraterrestrial alien life plotting the demise of the world starting in California. Right, well, we all hope we don’t have to move to Texas. Highly scientific? It’s not a “region” or “area”, it’s a blob ? Techtonic plates subducting pacific northwest? I’m not sure how anyone hasn’t connected the dots on this yet but it’s most likely a hole in the ozone. There’s a few of them now from what they believe is the start of the magnetic poles changing positon and probably some man made interference. Drag some icebergs into it – we do have that technology – do we not? Unless they drug a lot of massive iceberg’s It wouldn’t have much effect. It takes a lot of Ice to cool down water even in an isolated system (energy is not entering or leaving the system). This blob is 300feet deep by 1000 miles wide. If you model it as a perfect cylinder its over 180 thousand miles^3 of water. Even 1 thousand miles^3 of ice would have almost no effect. Great way to paint a picture of the size of this thing – much appreciated. Actually 44.8 cubic miles. Take your radius as 500 miles. No, we do not have the technology to do that. If we did the effect would be far more sever than the problem it is to alleviate. The amount of ice required to change the temperature of several thousand cubic miles of sea water a few degrees would severely disrupt the salinity of that region. Thanks Joe – I had forgotten the salinity factor – that is a factor in generating current – yes? Wasn’t implying my suggestion was ‘gospel’ just fishing for possibilities – thanks for your polite response. drop 4 ice cubes in a swimming pool and see how much the temperature drops. Drop it from space and everyone dies…. Climate scientists have been saying that ocean temperatures are the larger concern for years now. Apparently the media has ignored this until now we have a perfect example of exactly why it is ocean temperatures, not air temperatures, that are the greater indicator of climate change. Did *you* read the article? The article didn’t say the “blob was not formed by global warjming [sic.]. In fact, the article didn’t say one way or the other. And Aaron is correct that a major concern for climate scientists is how global warming will affect ocean temperatures and currents in both the atmosphere and the ocean. Did you read the article? It absolutely said it was not caused by global warming. Did you read his comment thoroughly? How do they know? Much of this is still conjecture. Please get someone who knows how to read and edit to write your stories and especially, your headlines! Right now, it clearly says the opposite of what you want it to say. Obviously not a native English speaker, cut them some slack. The headline perplexed me as well and you make a good observation. Makes a good case for at least one reviewer; in this case there appears to be no reviewer. The article is about an area of warm water that they believe may be the cause or at least adds to the drought. It should have correctly read: California drought attributed to strange blob of warm water, otherwise this is saying that the blob of water was caused by the drought, not the other way around. Yep and the change of one word would have made the headlines true. If they had used Contributed to instead of attributed to all would have been correct. Check your dictionary again. Both ways are correct. regard a quality or feature as characteristic of or possessed by (someone or something). Is there any way to break up the blob? Not without unwanted consequences such as changing the ocean currents. Tell Gov Moonbeam to stop sending all that fresh water down into the Ocean!